Long CN. 2010. "Correcting for circumsolar and near-horizon errors in sky cover retrievals from sky images." The Open Atmospheric Science Journal, 4(1), 10.2174/1874282301004010045. Fractional sky cover amounts retrieved from sky imagery are overestimated significantly at times due to occurrences of “whitening” near the sun, and near the horizon for low sun, in the images. This phenomenon occurs due to forward scattering of visible light by aerosols and haze, as well as the intensity range limitations of the detectors of the cameras used to record the sky images. Thus, while sky imagers afford much better consistency in documenting sky cover compared with human observations, for some sky conditions they suffer from errors it would be best to correct for. In the development of the original Hemispheric Sky Imager (HSI) prototype on which the Total Sky Imager (TSI) is based, this problem was recognized, and initial development of a method for correction was begun. As a result, the clear/cloudy pixel count information for various areas of the sky images needed for the correction methodology has always been included in the sky cover retrieval processing of the ARM TSIs. This paper presents a description of the methodology in sufficient detail for readers to be able to apply the methodology. Sky cover retrievals from a TSI and an HSI are analyzed to correct for the overestimation caused by this “whitening” problem. An example long-term analysis is presented to illustrate and verify the impact and utility of applying the correction methodology. Analysis results suggest that when the problem occurs, the magnitude of the overestimate is typically on the order of about 10% to 20% fractional sky cover. To help alleviate this problem, a simple, computationally efficient statistical analysis of the time series of the areas in the image near the sun position and along the horizon centered on the solar azimuth angle has been developed. This statistical analysis requires that images be captured frequently, at least once per minute. For times when the overestimation is detected as occurring, a correction is applied to the retrieved sky cover amounts. Analysis indicates that the corrected sky cover amounts better match the actual sky conditions present, as noted by visual inspection of the sky images in question. In addition, frequency-of-occurrence histogram comparisons show that the adjusted results improve the agreement with other methodologies and expectations. Additional comparisons verifying the methodology are presented in Long et al., 2006. 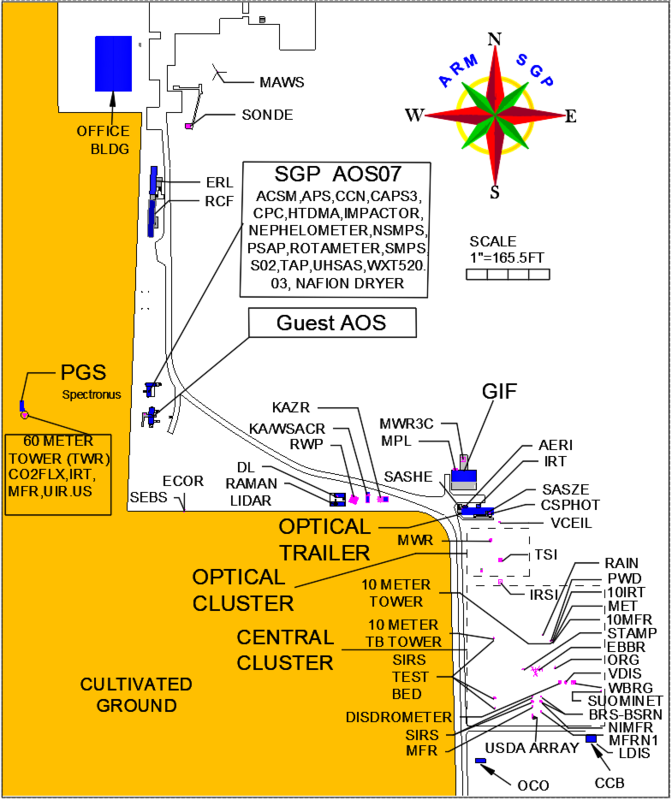 The methodology presented here helps produce more accurate fractional sky cover retrievals from sky imaging systems such as those used at the ARM sites. We note that current ARM Total Sky Imager daily report files already include the information needed to implement this correction methodology, thus promoting implementation as an ARM Value-Added Product at minimal cost and effort. The correction methodology uses the daily report files currently produced by the processing of the TSI images. Thus, application of the correction methodology does not involve labor-intensive reprocessing of the sky images themselves. Rather, the correction methodology uses statistical analysis of the image-to-image clear/cloudy pixel accounting contained in the daily report files, and as such is an extremely computationally inexpensive process that can be fully automated for batch or single-file processing. Sample sky image (left) and corresponding cloud decision image (right) showing an example of the over-estimating problem. White and gray in the cloud decision image denote cloud, and blue denotes clear sky. The areas outlined in green around the sun and extending in an arc to either side of solar azimuth are the “sun circle” and “horizon area” problem areas. As shown in this example, the two areas contain pixels erroneously determined as “cloud” while the sky image shows clear sky. Sky cover frequency histogram for the sky imager deployed during the ARM Cloudiness Inter-Comparison field experiment at the Southern Great Plains site. Red columns represent the original uncorrected retrievals, blue the adjusted retrievals, and striped represents retrievals restricted to a 100° field-of-view. Blue line (referenced to right axis) is the difference between the adjusted retrievals and the 100° FOV, and the red line is the difference between the original and adjusted 160° retrievals.